How It’s New York: The gig is at Rockwood Music Hall, which features lots of musicians in one hour sets, most are free (Sarah’s not, but it’s only $10), from the very well known to the up and coming. Sarah Siskind plays there this Thursday, Julie Feeney is there on the 18th. How It’s Irish: Sarah Siskind played with Paul Brady in the first ever Masters in Collaboration concert at Irish Arts Center. If Paul loves her, you should, too. 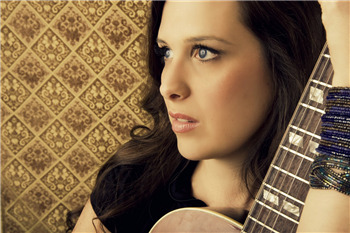 Grammy nominated artist Sarah Siskind is in town with her new album, Novel, just released September 27. Bonnie Raitt’s favorite song is “Take Me” (track #3). The album is, like Andy Irvine’s, old school– recorded with just one mic, some guitars, and “found sounds” from her kitchen pantry (what is it with musicians and kitchens? The Kane Sisters recorded part of their last album Side by Side in their kitchen also!). The percussion includes dry rice and oatmeal boxes (I hope it was McCann’s!). Sarah also makes jewelry from charms and beads that she sells at her gigs, for added incentive to get down to Rockwood (she also sells them at Etsy). She’s gluten and wheat-free (this health thing is going around) shares recipes, tips and restaurant/brewery suggestions on her food blog.